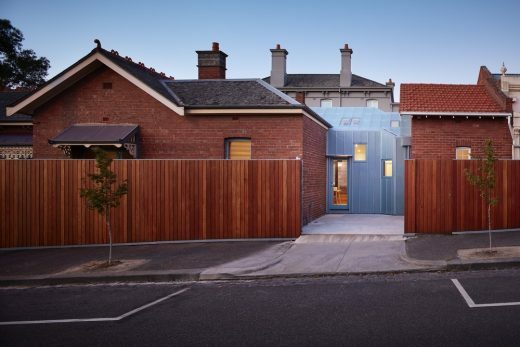 In Connect Parkville we pursue the idea of “stitching together” urban fabric with “quiet architecture”, informed by Austrian architect Hermann Czech’s “architecture as background”. We work to principles of “simple moves” and economy: no more, or less, than is necessary to achieve our program. These are universal ideals applied in a site and brief specific response. 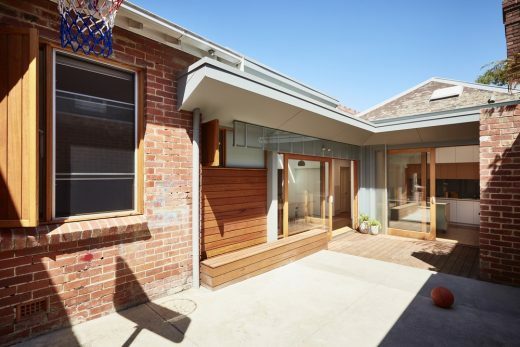 This project, for a family of five in a visually intact but functionally stressed conservation area, required another layer over existing program and built form. Our insertion is a quiet addition that relies not on references but scale and contrast executed with appropriate confidence. The addition is backdrop, its exterior casual, formed by lightness. 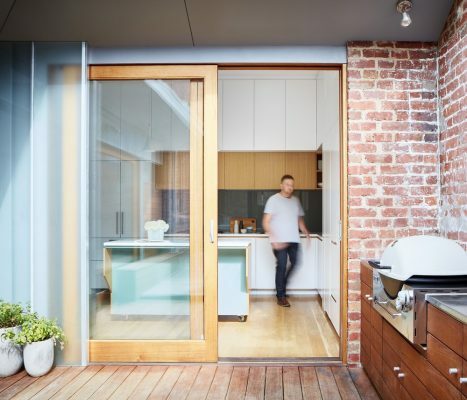 We have taken the idea of layering literally: the brief (accommodation, domestic activities, outdoor activities, storage) calls for new space (internal and external), connectivity and a skin: floor, wall, roof. 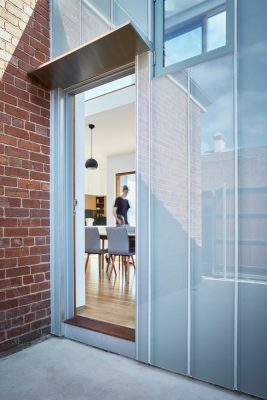 The skin protects from and is open to the outside, and relates to its built context. Surrounded by solid masonry walls, the new works are layered and loose: the roof is lifted, split and extended; new walls show multiple skins; the main façade is screened with obscure glass to express ambiguity. 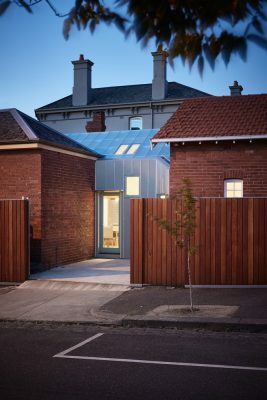 To the street the new addition appears transparent under the sun and the extension seems to float. 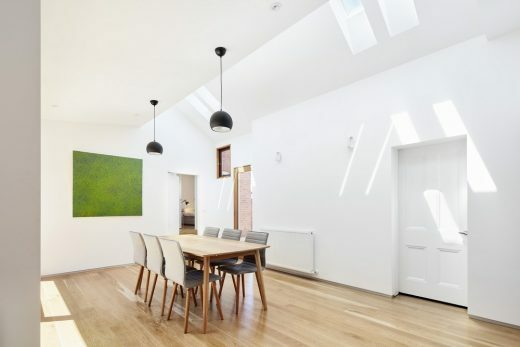 Sun penetration through skylights continuing to the outside and reflections add to the notion of “layers of light”. We pushed our program hard to incorporate this detail into this domestic realm (and stay within average costs for a project of this nature). We introduced ease of use and informality, lightness in more than one sense of the word. 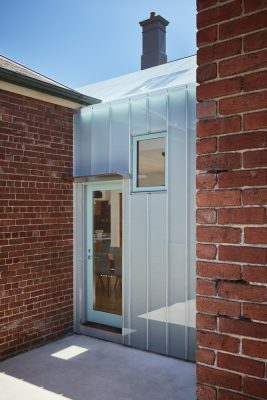 The old house was opened for flow and interaction; main residence and out building linked with simple gestures. 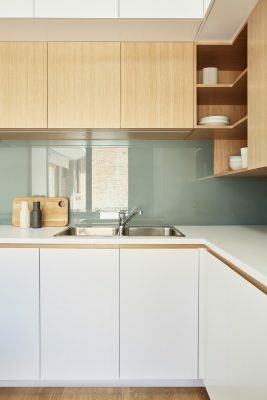 Communal functions in the home are separate but connected: the kitchen as transitional space; dining a discrete light-filled atrium; and the living room as introvert retreat. To create an inherently sustainable project the solution considers solar control, thermal comfort, natural light, and ventilation. 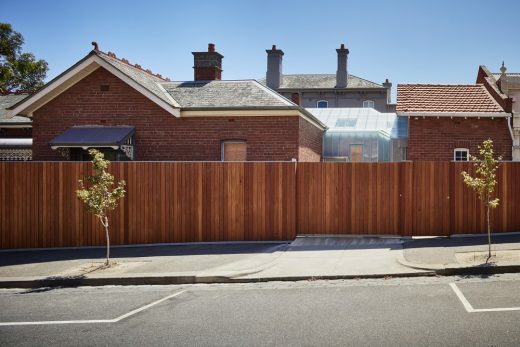 Connect Parkville makes a modest, respectful, but notable contribution to its renewed urban fabric.